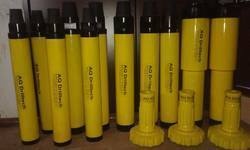 Offering you a complete choice of products which include borewell drilling bits, dht borewell hammer bits, water well (dth), well drilling dth bits, dth borewell hammer bits and water well drilling dth bits. 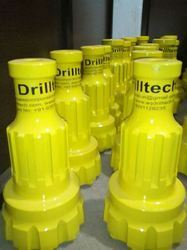 AQ DrillTech has manufacture Borewell Drilling Bits from superior quality material EN 36C alloy steel forgings to make sure long life and efficient Hole drilling operations, it has been fabricated through numerous machining process to deliver an immaculate body for high resistance to abrasion, wear and stretch that is normally experienced amid penetrating. Bits body has heat treated to required hardness that extends the Bit life for maximum performance in the toughest drilling conditions, and fitted with high quality imported tungsten carbide buttons has to give greatest drilling experience. The placement of carbide buttons on the bit face is powerful hydraulically pressed keeping up proper interference and gauge allows full scope of button bit diameter and face. 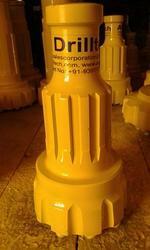 The flushing grooves and holes verify very nearly flushing efficiency for better drilling. AQ DrillTech has manufacture DHT Borewell Hammer Bits from superior quality material EN 36C alloy steel forgings to make sure long life and efficient Hole drilling operations, it has been fabricated through numerous machining process to deliver an immaculate body for high resistance to abrasion, wear and stretch that is normally experienced amid penetrating. Bits body has heat treated to required hardness that extends the Bit life for maximum performance in the toughest drilling conditions, and fitted with high quality imported tungsten carbide buttons has to give greatest drilling experience. The placement of carbide buttons on the bit face is powerful hydraulically pressed keeping up proper interference and gauge allows full scope of button bit diameter and face. The flushing grooves and holes verify very nearly flushing efficiency for better drilling. AQ DrillTech has manufacture Water Well (DTH) from superior quality material EN 36C alloy steel forgings to make sure long life and efficient Hole drilling operations, it has been fabricated through numerous machining process to deliver an immaculate body for high resistance to abrasion, wear and stretch that is normally experienced amid penetrating. Bits body has heat treated to required hardness that extends the Bit life for maximum performance in the toughest drilling conditions, and fitted with high quality imported tungsten carbide buttons has to give greatest drilling experience. The placement of carbide buttons on the bit face is powerful hydraulically pressed keeping up proper interference and gauge allows full scope of button bit diameter and face. The flushing grooves and holes verify very nearly flushing efficiency for better drilling. AQ DrillTech has manufacture Well Drilling DTH Bits from superior quality material EN 36C alloy steel forgings to make sure long life and efficient Hole drilling operations, it has been fabricated through numerous machining process to deliver an immaculate body for high resistance to abrasion, wear and stretch that is normally experienced amid penetrating. 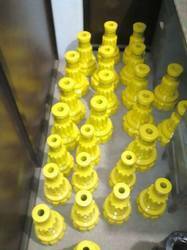 Bits body has heat treated to required hardness that extends the Bit life for maximum performance in the toughest drilling conditions, and fitted with high quality imported tungsten carbide buttons has to give greatest drilling experience. The placement of carbide buttons on the bit face is powerful hydraulically pressed keeping up proper interference and gauge allows full scope of button bit diameter and face. The flushing grooves and holes verify very nearly flushing efficiency for better drilling. AQ DrillTech has manufacture DTH Borewell Hammer Bits from superior quality material EN 36C alloy steel forgings to make sure long life and efficient Hole drilling operations, it has been fabricated through numerous machining process to deliver an immaculate body for high resistance to abrasion, wear and stretch that is normally experienced amid penetrating. Bits body has heat treated to required hardness that extends the Bit life for maximum performance in the toughest drilling conditions, and fitted with high quality imported tungsten carbide buttons has to give greatest drilling experience. The placement of carbide buttons on the bit face is powerful hydraulically pressed keeping up proper interference and gauge allows full scope of button bit diameter and face. The flushing grooves and holes verify very nearly flushing efficiency for better drilling. AQ DrillTech has manufacture Water Well Drilling DTH Bits from superior quality material EN 36C alloy steel forgings to make sure long life and efficient Hole drilling operations, it has been fabricated through numerous machining process to deliver an immaculate body for high resistance to abrasion, wear and stretch that is normally experienced amid penetrating. Bits body has heat treated to required hardness that extends the Bit life for maximum performance in the toughest drilling conditions, and fitted with high quality imported tungsten carbide buttons has to give greatest drilling experience. The placement of carbide buttons on the bit face is powerful hydraulically pressed keeping up proper interference and gauge allows full scope of button bit diameter and face. The flushing grooves and holes verify very nearly flushing efficiency for better drilling. 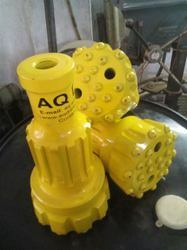 AQ DrillTech has manufacture DTH Hammer for Water well drilling from superior quality material EN 36C alloy steel forgings to make sure long life and efficient Hole drilling operations, it has been fabricated through numerous machining process to deliver an immaculate body for high resistance to abrasion, wear and stretch that is normally experienced amid penetrating. Bits body has heat treated to required hardness that extends the Bit life for maximum performance in the toughest drilling conditions, and fitted with high quality imported tungsten carbide buttons has to give greatest drilling experience. The placement of carbide buttons on the bit face is powerful hydraulically pressed keeping up proper interference and gauge allows full scope of button bit diameter and face. The flushing grooves and holes verify very nearly flushing efficiency for better drilling. AQ DrillTech has manufacture Borewell Driling Bit from superior quality material EN 36C alloy steel forgings to make sure long life and efficient Hole drilling operations, it has been fabricated through numerous machining process to deliver an immaculate body for high resistance to abrasion, wear and stretch that is normally experienced amid penetrating. Bits body has heat treated to required hardness that extends the Bit life for maximum performance in the toughest drilling conditions, and fitted with high quality imported tungsten carbide buttons has to give greatest drilling experience. The placement of carbide buttons on the bit face is powerful hydraulically pressed keeping up proper interference and gauge allows full scope of button bit diameter and face. The flushing grooves and holes verify very nearly flushing efficiency for better drilling. 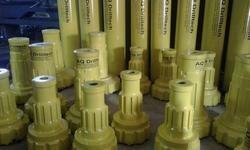 AQ DrillTech has manufacture Borewell Hammer and Bits from superior quality material EN 36C alloy steel forgings to make sure long life and efficient Hole drilling operations, it has been fabricated through numerous machining process to deliver an immaculate body for high resistance to abrasion, wear and stretch that is normally experienced amid penetrating. Bits body has heat treated to required hardness that extends the Bit life for maximum performance in the toughest drilling conditions, and fitted with high quality imported tungsten carbide buttons has to give greatest drilling experience. The placement of carbide buttons on the bit face is powerful hydraulically pressed keeping up proper interference and gauge allows full scope of button bit diameter and face. The flushing grooves and holes verify very nearly flushing efficiency for better drilling. AQ DrillTech has manufacture DTH Borewell Hammer Bit from superior quality material EN 36C alloy steel forgings to make sure long life and efficient Hole drilling operations, it has been fabricated through numerous machining process to deliver an immaculate body for high resistance to abrasion, wear and stretch that is normally experienced amid penetrating. Bits body has heat treated to required hardness that extends the Bit life for maximum performance in the toughest drilling conditions, and fitted with high quality imported tungsten carbide buttons has to give greatest drilling experience. The placement of carbide buttons on the bit face is powerful hydraulically pressed keeping up proper interference and gauge allows full scope of button bit diameter and face. The flushing grooves and holes verify very nearly flushing efficiency for better drilling. AQ DrillTech has manufacture Water Well (DTH) Drilling Digger DTH Button Bits from superior quality material EN 36C alloy steel forgings to make sure long life and efficient Hole drilling operations, it has been fabricated through numerous machining process to deliver an immaculate body for high resistance to abrasion, wear and stretch that is normally experienced amid penetrating. Bits body has heat treated to required hardness that extends the Bit life for maximum performance in the toughest drilling conditions, and fitted with high quality imported tungsten carbide buttons has to give greatest drilling experience. The placement of carbide buttons on the bit face is powerful hydraulically pressed keeping up proper interference and gauge allows full scope of button bit diameter and face. The flushing grooves and holes verify very nearly flushing efficiency for better drilling. AQ DrillTech has manufacture Borewell Hammer Bits from superior quality material EN 36C alloy steel forgings to make sure long life and efficient Hole drilling operations, it has been fabricated through numerous machining process to deliver an immaculate body for high resistance to abrasion, wear and stretch that is normally experienced amid penetrating. Bits body has heat treated to required hardness that extends the Bit life for maximum performance in the toughest drilling conditions, and fitted with high quality imported tungsten carbide buttons has to give greatest drilling experience. The placement of carbide buttons on the bit face is powerful hydraulically pressed keeping up proper interference and gauge allows full scope of button bit diameter and face. The flushing grooves and holes verify very nearly flushing efficiency for better drilling. 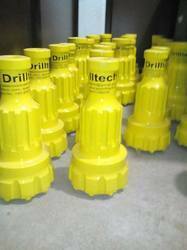 Looking for Water Well Drilling DTH Bits ?